Nat "King" Cole (March 17th 1919?February 15th 1965) was a popular American singer and jazz musician. As a piano player, he formed a jazz trio in 1938 that played Los Angeles nightclubs, one of the first jazz trios featuring guitar and piano. Prior to this he had played music since he was a child and had worked with bands since he was sixteen. He was raised in Chicago and exposed to the abundant jazz scene there. He was heavily influenced by pianist Earl "Fatha" Hines. Later he became more popularly known as a singer and crooner and his work became more orchestrated. As a piano player, he formed a jazz trio in 1938 that played Los Angeles nightclubs, one of the first jazz trios featuring guitar and piano. Prior to this he had played music since he was a child and had worked with bands since he was sixteen. He was raised in Chicago and exposed to the abundant jazz scene there. He was heavily influenced by pianist Earl "Fatha" Hines. Later he became more popularly known as a singer and crooner and his work became more orchestrated. His first mainstream vocal hit was in 1944 with Straighten Up and Fly Right, based on a black folk tale that his father had used as a theme for a sermon. Although hardly a rocker, the song's success proved that an audience for folk-based material existed. It is considered a predecessor to the first rock and roll records. Indeed, Bo Diddley, who performed similar transformations of folk material, counted Cole as an influence. Beginning in the late 1940s, Cole began recording and performing more pop-oriented material for mainstream audiences, often accompanied by a string orchestra. His stature as a popular icon was cemented during this period with such hits as The Christmas Song (1946), Nature Boy (1948), Mona Lisa (1950), and his signature tune Unforgettable (1951). While this shift to pop music led some jazz critics and fans to accuse Cole of selling out, he never totally abandoned his musical roots; as late as 1956, for instance, he recorded an all-jazz album, After Midnight. In 1991, Mosaic Records released the Complete Nat King Cole Trio Recordings on Capitol, which contained 349 songs on twenty-seven LPs or eighteen CDs. Throughout the 1950s Cole continued to rack up hit after hit, including Smile, Pretend, A Blossom Fell, and If I May. Most of his pop hits were collaborations with famed arranger/conductor Nelson Riddle. It was with Riddle that Cole released his first ten-inch long-play album in 1953 entitled Sings for Two in Love. Several more albums followed, including the Gordon Jenkins arranged Love Is The Thing, which reached number one on the album charts in April 1957. Inspired by a trip to Havana, Cuba in 1958, Nat went back there that same year and recorded Cole Espanol, an album sung entirely in Spanish and Portuguese. The album was a hit not only in the U.S., but in Latin America as well. The album was so popular, that two others followed: A Mis Amigos in 1959, and More Cole Espanol in 1962. Musical tastes were changing in the late 1950s, and despite a successful stab at rock n' roll with Send for Me, Cole's ballad singing had grown old to younger listeners. Like contemporaries Dean Martin, Frank Sinatra and Tony Bennett, Nat found that the pop singles chart had been almost entirely taken over by youth oriented acts. In 1960, Nat's longtime collaborator Nelson Riddle, left Capitol Records for Frank Sinatra's newly formed Reprise Records label. The two parted ways with one final hit album Wild Is Love, based on lyrics by Ray Rasch and Dotty Wayne. Nat would later re-tool the concept album into an off-Broadway production called I'm With You. As the 1960s progressed, Nat once again found success on the American singles chart, starting with the country/pop flavored hit Ramblin' Rose in August of 1962. Three more hit singles followed: Dear Lonely Hearts, Those Lazy, Hazy, Crazy Days of Summer, and That Sunday, That Summer. Nat's final album was entitled L.O.V.E, and was recorded in late 1964. It was released just prior to his death and reached number four on the Billboard Albums chart in the spring of 1965. A "Best Of" album went gold in 1968. His 1957 song When I Fall in Love was a chart topping hit for the U.K. in 1987. Cole was the first African-American to have his own radio program. He repeated that success in the late-1950s with the first truly national television show starring an African-American. In both cases, the programs were ultimately canceled because sponsors shied away from a black artist. Cole fought racism all his life, refusing to perform in segregated venues. In 1956, he was attacked on stage in Birmingham, Alabama by members of the White Citizens' Council who apparently were attempting to kidnap him. Despite injuries, Cole completed the show but vowed never to perform in the South again. On 23rd August 1956, Cole spoke at the Republican National Convention in the Cow Palace, San Francisco, California. He was also present at the Democratic National Convention in 1960, to throw his support behind President John F. Kennedy. Cole was also among the dozens of entertainers recruited by Frank Sinatra to perform at the Kennedy Inaugural gala in 1961. Nat King Cole frequently consulted with President Kennedy (and later President Johnson) on the issue of civil rights. Yet he was dogged by critics, who felt he shied away from controversy when it came to the civil rights issue. Among the most notable was Supreme Court Justice Thurgood Marshall, who was upset that Cole didn't take stronger action after the 1956 on-stage attack. In 1948, Cole purchased a house in the all-white Hancock Park neighborhood in Los Angeles, California. The property owners association told Cole they didn't want any undesirables moving in, to which Cole retorted "Neither do I. And if I see anybody undesirable coming in here, I'll be the first to complain." He and his second wife, Maria Ellington, were married in Harlem's Abyssinian Baptist Church by Adam Clayton Powell, Jr. They had five children, including twin girls. Daughter Carol Cole, and son Kelly Cole were adopted. Kelly Cole died in 1995. Nat's daughter, Natalie Cole, and his younger brother, Freddie Cole are also singers. Natalie and her father had an unexpected hit in the summer of 1991. The younger Cole mixed a 1961 recording of her father's rendition of Unforgettable with her own voice, creating an electronic duet. Both the song and the album of the same name won several Grammy awards the following year. Cole performed in many short films, and played W. C. Handy in the film Saint Louis Blues. He also appeared in The Nat King Cole Story, China Gate, and The Blue Gardenia. 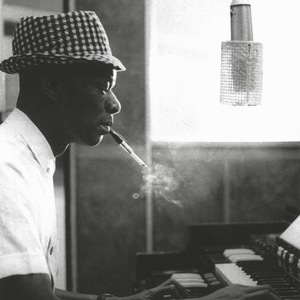 Nat King Cole, a heavy smoker, died of lung cancer at St. John's Hospital in Santa Monica, California, on 15th February 1965. His funeral was held at St. Victor's Catholic Church in West Hollywood, and he was buried in Forest Lawn Memorial Park in Glendale, California. Cat Ballou, his final film, was released several months later.